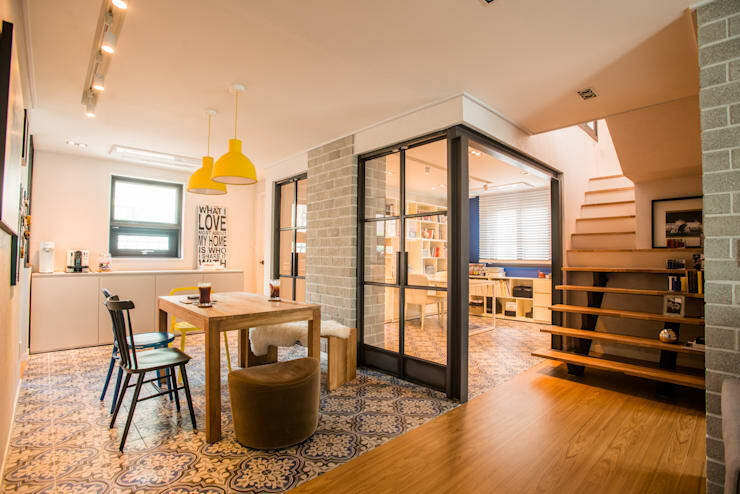 Today on homify we will be exploring an open-plan apartment with a very clever and characterful separation of living spaces. This is a great apartment to explore if you're looking for ideas on building internal walls and how to make the most of every inch in a city apartment. The dining room, hallway and living room are arranged as separate spaces with a strong visual connection. The internal glass doors play a large role in this layout. But let's not overlook the floor tiles. They demarcate the boundaries of the hallway while also connecting the living room and dining. The narrow kitchen is small but efficient. Floor-to-ceiling kitchen cupboards have been installed on one wall to provide lots of storage. But it's the very narrow benches that have our attention. They make the most of the wall space while drawing focus to the generously large windows that run on this side of the apartment. 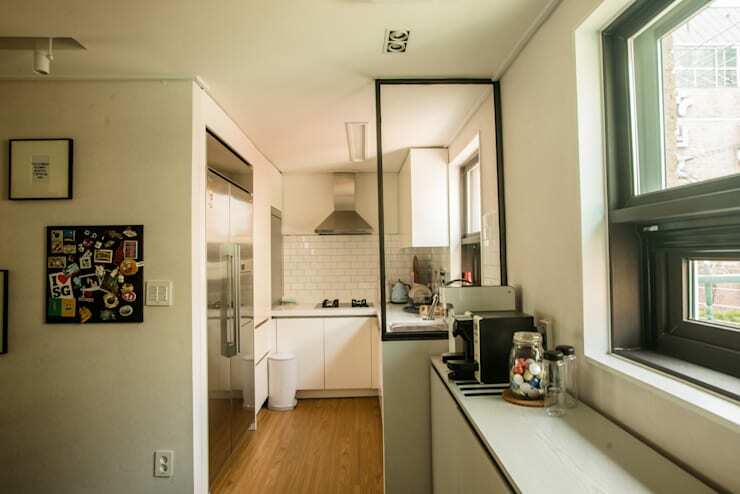 Note the black framed internal window that marks the boundary of the kitchen. 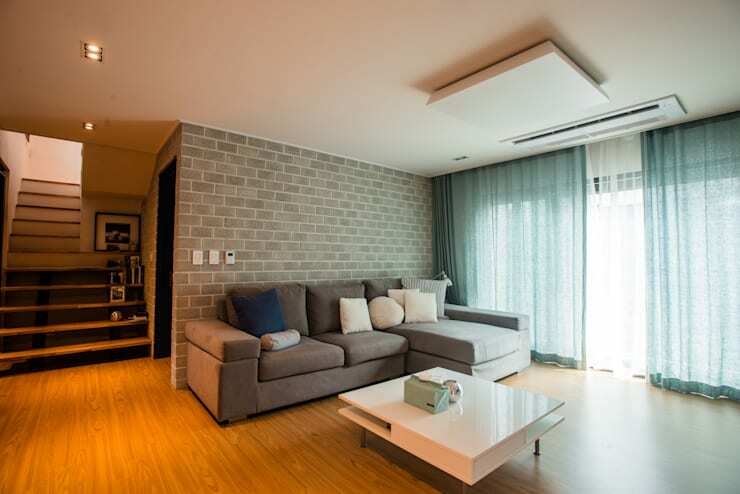 This is a great alternative to a standard opaque wall and makes the narrow apartment feel bright and expansive. The living area is covered with floor-to-ceiling glass sliding doors on one side. The modular sofa has been pushed up against the brick wall and the living area feels soothing and relaxing. The apartment has been decorated with a wide colour palette that gives the home lots of homely appeal. 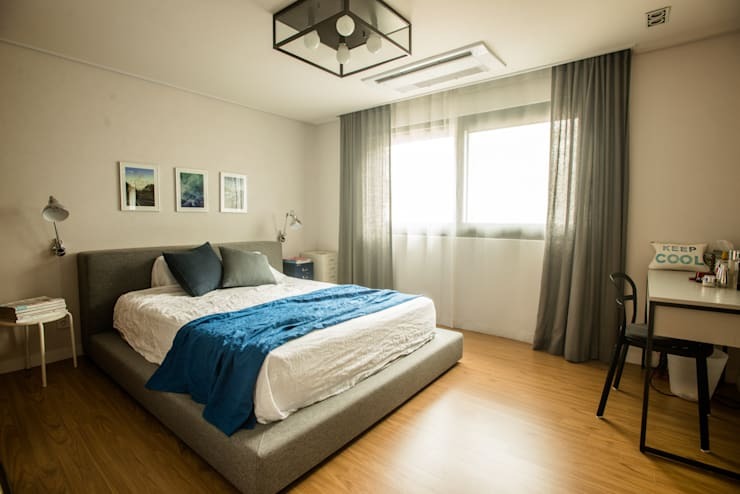 But in some rooms such as this, the designers have narrowed down their choices and employed a subtle combination of blue, grey and subdued brown. This gives the living room a distinct ambience and separates it from the other living zones we explored earlier. The bedroom has a similar grey/blue colour scheme. This time, the blues have been amped up a notch or two and offer more vibrancy. Despite the rather small window, floor-to-ceiling drapes have been installed. These make the window appear larger and make the bedroom feel soft, luxurious and comforting. Finally, note the awesome ceiling light. It reflects the style of the black frames on the inner windows and partitions we saw earlier. 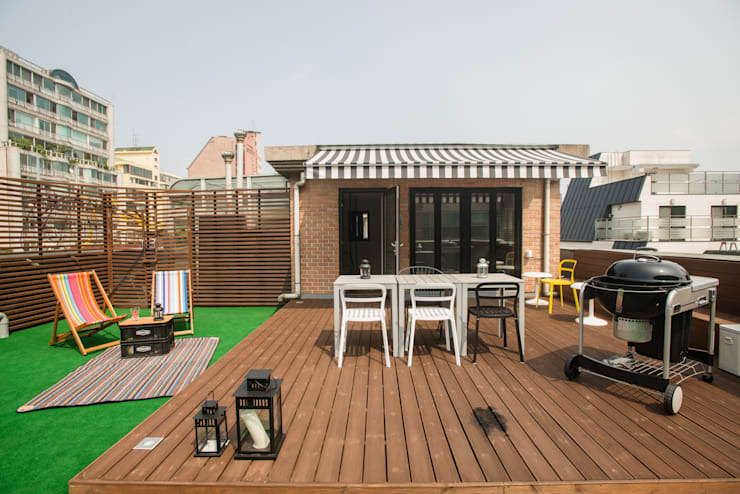 The owners are fortunate enough to have a large roof terrace. Wooden walls have been installed to create privacy and an unusual astroturf area, complete with lounge-chairs, has been installed. It's the perfect place for entertaining friends and family! If you're thinking about re-zoning your open-plan home, you need to read How to separate spaces at home without building walls. Which room in this eclectic apartment is your favourite? Let us know your thoughts!